Because it would be a sin *not* to share the horror show that is my UFO bin with the entire internets. Wendy gave me this sock yarn last summer. That little nub in the corner represents the entirety of my knitting for the 3 weeks we were in Europe last fall. For shame. Quickly put aside under Cara's theory that it's easier to finish a pair if you've got two going at the same time. And when you actually stop to think about the inherent flogic of the above statement, it's perfectly clear why I now just have 2 pairs of unfinished jaywalkers instead of one finished pair. 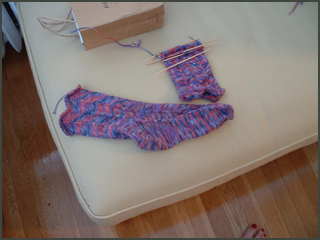 That 3rd sock isn't even a jaywalker, I just was drinking and decided I needed something easier to knit on. 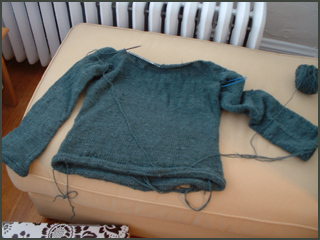 Forestalled by the realization that it might not be prudent to knit a tank in fuzzy silk-mohair. Because if it's warm enough for a tank, it's too hot for silk-mohair. Check out this brilliant idea. I knit this in cotton, that the label TOLD ME would shrink. And so instead of knitting a swatch, washing it and seeing what it would do, I just decided to knit the next biggest size. Which might be why I've been ignoring it for over a year now. Mittens for my brother, with a great snowflake/skier motiff. 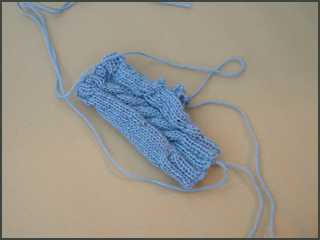 Except that I hadn't yet figured out how to do 2-color knitting. Hence the tragedy you see above. 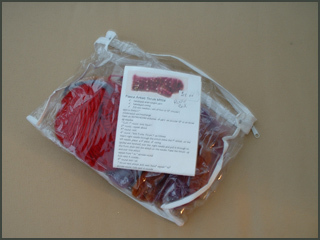 This one is the Fleece Artist thrummed mitten kit. One mitten done, the second will never exist, because in a fit to start spinning, I spun all the thrum fleece on my spindle. Yet so far. Because I still have to knit the second one. Argh. 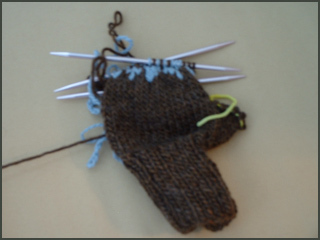 Except that it's WAY more likely I'll knit the second mitten. This one was clearly a misguided pattern choice. which will never happen now, because someone submitted something similar, yet much more clever and fashionable. 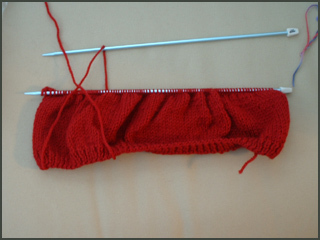 Before I had ever knit on a circular needle. 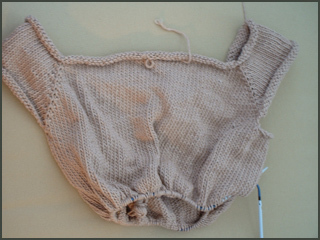 The only way this one will ever be knit is if I rip out and start over. Which wouldn't be a huge deal, since I only got about 4 INCHES up in the first place. I'm getting close on this one, and I'm thinking I might actually like the results. Small wonder since I used the yarn the pattern called for, knit a swatch and made no alterations to the pattern whatsoever. There's gotta be a lesson in that somewhere. Jackie... thank you SO much for this post... 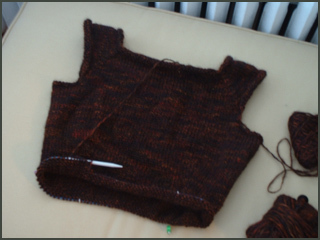 I was beginning to feel like a knitting reject when I would look in my closet and see how many unfinished projects I have. 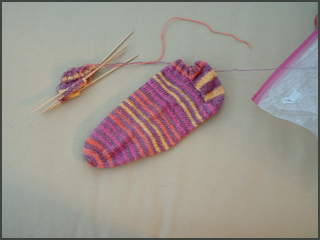 Was one of those socks one of the projects you were working on at Kate's this past summer? man -- do you have any free needles left? oh god - the fact that you spun your thrums is funnier than i can possibly explain. i just know that in this post, mrs. jkp, you totally brought the funny. Rip 'em all out, baby. You'll feel better. Ha ha! I love your descriptions - and that you spun your thrums is too funny! That last sweater really does look great - finish it up! At one point in reading this I thought there couldn't possibly be more UFOs - and then there were! I'm especially amused that you have enough jaywalkers for a pair, yet they're not a pair. Awesome. What is that thing on your leg? A sleeve? It can't be a sock, it just can't. 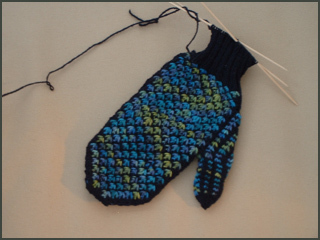 I still love that blue-green fishy scaled mitten. Make the second one! Good times. At least we're all in this together. It's a LEGWARMER! I love it!! LOL.. I had the most lucsious purple pair in high school... ahhh, the dreams! OK, seriously. Finish the hourglass, bring the thrummed mittens to Rhinebeck, and rip the rest of this stuff back to string and start afresh. Except for the socks. 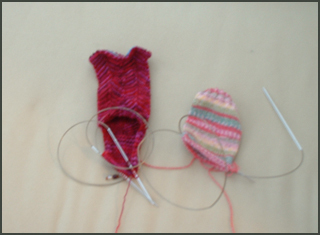 Socks don't count, and one can have as many of those on the needles as one wishes. Everything else goes. It'll feel better, I promise. Just don't make me show you my WIP basket(s). My favorite way of ignoring my WiPs? Leave them behind in Boston when I move for three months. Out of state, out of mind.